Tucson Employer Negligence Lawyers, Tucson Truck Accident Attorney | Russo, Russo & Slania, P.C. Being involved in an accident with an 18-wheeler is life-changing. People who survive these accidents are often forced to deal with the physical and financial consequences of serious injuries. Car accidents happen fast, and it can be difficult to know exactly what went wrong at the time of the accident. If you have been injured in an accident with an 18-wheeler, the trucking company may be responsible for your accident. When a company fails to maintain the safety of their vehicles and adequately manage their employees they endanger the lives of everyone on the road. When companies put innocent drivers and passengers in danger, an experienced Tucson trucking employer negligence lawyer can step in and fight for justice. The attorneys at Russo, Russo & Slania, P.C. are ready to help you take on trucking companies when their negligence has caused serious harm. For over 60 years we have stood by accident survivors and helped them pursue the justice they deserve. We understand taking legal action after being involved in an accident can be a difficult decision to make, but we are committed to making the process as easy as possible. Call our office at (520) 529-1515 to speak with a lawyer today. Do I Need an Employer Negligence Lawyer? Serious trucking accidents present accident victims with plenty of new challenges. Life-changing injuries, overwhelming hospital bills, physical rehabilitation, and financial losses are all common obstacles that people involved in 18-wheeler accidents face. If you are experiencing the stress and uncertainty of dealing with these challenges, the skilled guidance of a lawyer can help you through this difficult time. In the event that a trucking company’s negligence is to blame for an accident, a lawyer will be able to determine in what ways and to what extent the company’s negligence has harmed you. Understanding if a company failed to maintain their fleet of vehicles, train employees properly, and uphold basic safety standards will all affect the amount of money you stand to win in court. Without a lawyer’s help, you may not realize that holding the employer liable is an option for you. If you only pursue a claim against a driver, your options for financial recovery will be diminished, because drivers’ individual insurance policies are likely to be vastly smaller than those of the company. Finances are often a huge concern for accident victims. Accident survivors commonly grapple with growing hospital bills in addition to losing wages from time taken off of work. In the wake of these stressors, the prospect of hiring a lawyer can seem like yet another enormous financial undertaking. Most injury lawyers only receive payment if they win the case, so hiring a lawyer will not add to your list of bills. The truck accident lawyers at Russo, Russo & Slania, P.C. have over 60 years of experience fighting for accident victims in our community so we truly understand the difficulties that accidents create for Tucson families. When trucking companies send dangerous drivers and vehicles to the road, they endanger the lives of countless people. If this negligence is to blame for an accident, our legal team fights to make sure that trucking companies don’t get away with it. By holding careless companies responsible when they cause serious harm to people, we make sure that more of these accidents are prevented in the future. 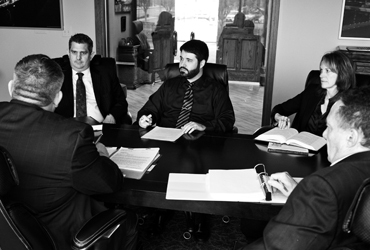 Our lawyers at Russo, Russo & Slania, P.C. have been a trusted resource for countless accident victims and we don’t take this honor lightly. If your life has been turned around because of someone else’s carelessness, we are more than ready to step in to provide the legal support that you need at this time. Our success has won us the admiration of clients and colleagues alike, including a perfect 10 rating on Avvo and an AV-Preeminent rating with Martindale-Hubbell. In the event that we are not able to receive the compensation that you need, you do not owe us a dime. If you tragically lost a loved one in a trucking accident caused by employer negligence, Russo, Russo & Slania, P.C. can help you pursue a wrongful death claim. Through this claim, certain family members can recover compensation for final expenses, loss of support, loss of income, and other damages. If you have been injured in an 18-wheeler accident, a Tucson truck accident lawyer at Russo, Russo & Slania, P.C. can help. We will stand with you and make sure that trucking companies understand that there is a price to pay when they disregard the safety of others. Our team has been fighting negligent companies for years, so we know what innocent victims stand to lose in the wake of a serious accident. When a company disregards its responsibilities to safety, we fight to make sure that they don’t make the same mistake twice. You may be on the fence, uncertain about how you want to move forward with your case. One of our skilled lawyers would be happy to speak with you about your situation and help you determine which course of action is right for you. To talk with someone about your case today, call our offices at (520) 529-1515.